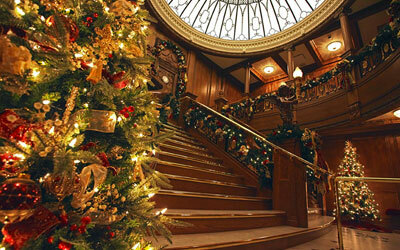 Inside and out, Titanic is magical during the winter holidays. The sights, sounds and joy of the season are sure to hail the arrival of Christmas 2018. You’re invited to stop by November thru December for Titanic’s holiday spirit. The ship will be aglow. Come exchange greetings with our Titanic crew or enjoy the glittering lights and the festive decorations. Children are awestruck by the glamour and glitter of it all. Their precious little faces light up like Christmas itself when first they spot Santa’s real-live reindeer tethered near the entrance, where they’re sure to want a souvenir photo taken. And if their timing is right, they might just score another keepsake photo while meeting Father Christmas and sharing with him their Christmas wishes. More than $100,000 has been invested in all the trimmings: twinkling lights, lush garlands, wreaths and towering Christmas trees. The cheery crew will join costumed merry-makers in stirring your memories of holiday gatherings gone by, while setting the scene for many more. Every day, we remember and honor the men, women and especially the 133 children who sailed RMS Titanic’s maiden voyage in 1912. But it’s during this special time of year that you’ll truly experience what it was like aboard ship and how it might have looked on a Christmas voyage 104 years ago.